Send 12 Yellow Gerberas Bunch to Chennai. Gifts to Chennai. Send Flowers to Chennai. 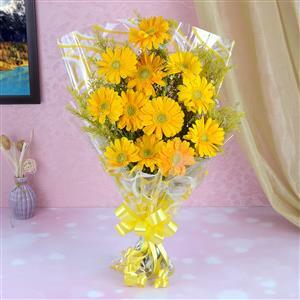 Description : A Bunch of 12 Yellow Gerberas with ribbon and Greens. A perfect Gifts to Chennai to bring good luck and best wishes in someone's life. Hence send this flower bouquet coupled with other gifts available at Gift2Chennai.com. Your loved ones in Chennai will cherish those precious memories for a long years to come.